April steering with poksai (paddle). All photos taken on Neni by David Butterfield. Saipan, CNMI – March 19, 2019 – Something remarkable happened on March 1, 2019, the first day of Women’s Month here in Saipan. 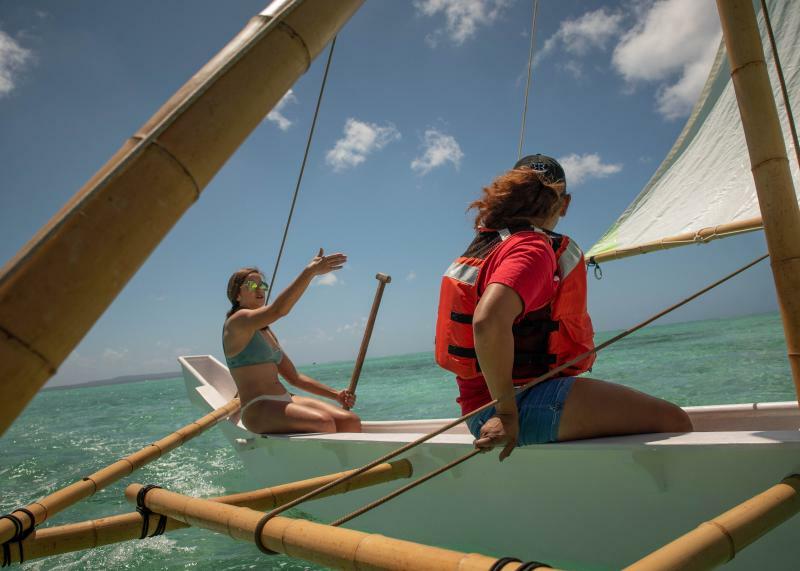 For the first time in about three hundred years, a woman of Chamorro descent started teaching another woman of Chamorro descent how to sail a canoe built from a traditional Chamorro design. They sailed about 6.5 miles from the Guma Sakman in Susupe to Seaplane Ramp in Lower Base. As often happens when women do something so significant, this event slipped by us. When I realized what they had done, I had to share this story. This could not have happened without the open hearts of Carolinian seafarers. In August 2018, Saipan’s 500 Sails started its Train the Trainers program, thanks to the support of the Northern Marianas Humanities Council. This program is being taught by Master Navigator Cecilio Raiukiulipiy, nephew of Grand Master Navigator Pius “Mau” Piailug. The generosity of these men, by sharing knowledge lost to almost all Pacific peoples, could save the maritime traditions here in the Marianas, both Chamorro and Carolinian. What is happening quietly as this program progresses is that women are eagerly stepping forward to learn to sail. Sophia Perez, of Chamorro and Western European descent, was one of the first pupils of Cecilio. Heeding the call of our canoes, she moved to Saipan from Brooklyn, New York in 2018. She has almost completed the course Cecilio has been formalizing and is part of the writing team, along with Art de Oro, finalizing the curriculum for future use in the Train the Trainers program. Sophia was the teacher on the March 1st sail. April Repeki, of Chamorro/Carolinian/Filipino descent, is already a cultural practitioner here in Saipan. She is the dance instructor for Marianas High School's Inafamaolek Cultural Club that performed at the 2019 Guam Chamorro Language Competition at the University of Guam, where they won 1st place in the Song and Dance category. She has been teaching dance in Saipan for over 10 years. Now she is expanding her cultural knowledge to include sailing. April was the student on the March 1st sail. Together, Sophia and April made history. They will continue to learn and teach others. 500 Sails programs take safety to heart; you will notice April wearing a life jacket. We have several different swim classes available to adults and school age children. The next round of students for Train the Trainers is being chosen from our swim program, as will the third round. Join us. Swim. Build. Sail.